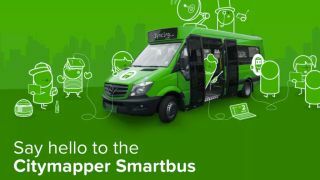 Citymapper is running a trial of a new ‘Smartbus’ that will identify the needs of its users and create a travel route in order to bridge the gap between user need and transport available. For years now Citymapper has been helping its users to navigate major cities by using up-to-the-minute information on transport networks to create routes that will get people from door to door as quickly and efficiently as possible. Now they are going one step further by providing their own mode of transportation. For now it is just a trial-run for two days in London, but considering the Citymapper app now serves around 40 cities worldwide, if the trial is a success, we wouldn’t be at all surprised to see a global roll out. The ‘popup route’ named CMX1 will run a set loop across the River Thames on May 9 and 10, and will be free to use for Citymapper users. It is currently unclear what this service will cost or how users would pay if the service were to become a long term fixture. It may seem like an unusual move for a company that has a very successful software-based model to start buying buses, but Citymapper’s CEO and former Google engineer Azmat Yusuf explained his motive to Wired: “All these other things are getting smarter and better, but why aren’t buses?” And he’s not wrong; aside from occasional changes in design and improvements of engines, buses are practically the same as when they started running in the 19th century. The new Citymapper bus is full to the brim with technology that helps both the user and the driver. There are displays that show information on where you currently are, where the next stop is, and current traffic. Plus, there are USB ports in all of the seats for easy charging of electronic devices. The coolest feature of all is the driver's software. On top of giving drivers information about amount of users on board and distance between buses, using Citymapper’s traffic algorithms the bus will be able to redirect to best serve users, rather than stick to an allocated route come-what-may. The proposed routes that this bus will run should it become a full service will be decided based on the needs of users. Citymapper identified from the searches that its users were making that there were certain journeys that were not being served by the current system, and thought that it could solve this problem by creating a transport option that could have a route dictated by real searches of real users. While this sounds like a welcome addition, there could be a hurdle for Citmapper in fully realizing this plan. Buses need to have the approval of TfL, London’s transport authority, before they are able to run. TfL has apparently been very cooperative with Citymapper when it comes to all things app-based, but it will be interesting to see if it'll be as willing to cooperate if Citymapper launches a service that could affect TfL's profits.